Successful drafting makes or breaks an NHL franchise. Since Doug Armstrong took over as the St. Louis Blues general manager in 2010, they have built very successfully from within. Several key draft selections have developed into cornerstones of the team. But it hasn’t all been roses. The Blues have missed, and missed badly, on a few top round selections as well. As we survey the best and worst draft picks of the Armstrong era, we’ll keep several things in mind. 1) These choices will be measured by NHL success with the Blues. Success in the junior leagues, internationally, or for another NHL team will not be considered. 2) For a pick to be a “bust,” it has to occur in the first two rounds. Rounds three and beyond are a dice roll at best. 3) By the same token, players selected in the third round or later who make impacts in the NHL are incredible finds by their organization, and therefore will be given special consideration as great picks. Due to the trade that sent Erik Johnson to Colorado, the Blues were without a first round pick in 2011, so Ty Rattie became their first selection. Rattie had a phenomenal career with the Portland Winterhawks of the WHL, one that included two 100 point seasons, a WHL championship, and a WHL playoff MVP trophy. He also looked great in the AHL, scoring 136 points across three extended seasons with the Chicago Wolves. For whatever reason, though, Rattie never caught on in the NHL. Perhaps his diminutive size — 5-foot-11, 170 pounds — is somewhat to blame. But the Blues never even gave Rattie an extended chance in the pros, and he bounced around the league somewhat. He later resurfaced with the Edmonton Oilers, where he was given the opportunity to play alongside Connor McDavid. Rattie has the speed to keep up with a player like McDavid, but it’s looking less and less like he’s a viable NHL performer, and even if he is, it will not be with the Blues. There was a time when Tommy Vannelli was thought of as a potential steal in the second round and was looked at as one of the team’s top defensive prospects. He suffered a debilitating concussion that kept him out for over a year, though, and his development stalled. Since then, defensive prospects like Colton Parayko, Vince Dunn, Jake Walman, and others have passed him by, and in 2018, the Blues decided not to tender Vannelli, allowing him to become an unrestricted free agent. Samuel Kurker is a second round pick that never played a game in the NHL. 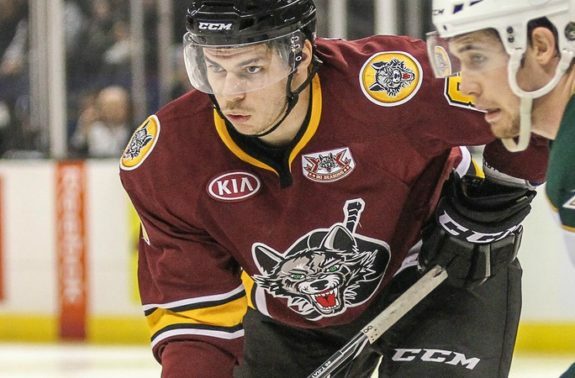 A defensive defenseman, Kurker scored just 30 points in 116 NCAA games with Boston University and Northeastern University, and since leaving college, he has bounced around several stops in the AHL and ECHL. He has never earned an NHL contract, and at 24, it’s unlikely that he ever will. As we will see, 2010 was one of the better draft years in team history; however, their second round pick was a swing and a miss. Sebastian Wännström signed a one year contract with the Blues in 2014-15, but he never played. He has not in fact played much anywhere outside of his native Sweden. He’s been a decent point producer there, but has never tempted any NHL team to give him a shot in the States, and given his high draft capital, he is the biggest bust of the Doug Armstrong era. The Blues have not missed much in the first round since Armstrong took over. But their record isn’t spotless, and Jordan Schmaltz looks likely to go down as the biggest first-round bust of the Doug Armstrong era. While there may be time for him to reignite his career, as a 2012 pick that has yet to make a big impact, that seems unlikely. In just 42 total NHL games, Schmaltz, who was drafted as an offensive defenseman, has five assists, no goals, and is a minus-7. He has had some highlights in the lower levels, including a stellar collegiate career and an AHL All-Star nomination in the 2017-18 season. 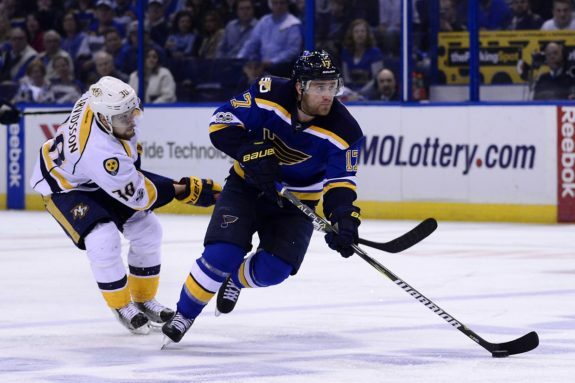 But with the Blues’ stacked defensive core ahead of him, it may be find for him to find playing time, and if he doesn’t do so soon, he’ll need to find someplace that he can. The Blues have several stellar prospects who are likely to become great NHL players, including these three top-40 picks. Only Robert Thomas has truly caught on in the NHL as of yet, and while he steadily improved throughout his rookie season, it is early to place him higher up this list. For Klim Kostin and Jordan Kyrou, the time is coming soon, and all three of these players could potentially earn a spot on this list in the future. 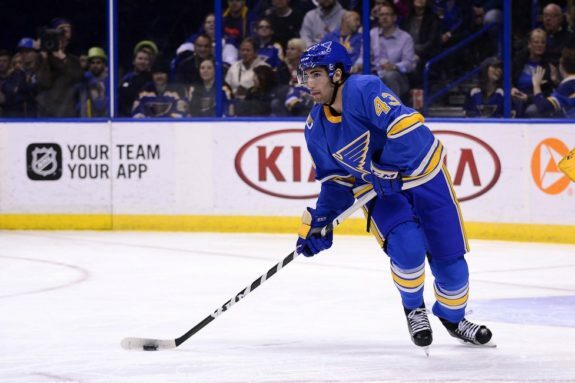 Robby Fabbri was an excellent first round selection who was lauded right out of the gate, earning the Blues high grades in the immediate aftermath of the 2014 draft. After one more season in juniors, Fabbri made his NHL debut and looked great, scoring 37 points in 72 games in 2015-16. But injuries have halted Fabbri’s career. He first suffered an ACL injury in February of 2017, and he re-injured that surgically repaired knee the following preseason. It is a devastating series of injuries from which to recover, and Fabbri struggled in his first season back. Time will tell whether he can ever regain the form he once had, but he remains on this list because of the potential he initially showed before the unforeseen injuries derailed his career. Let’s be clear: Samuel Blais has not fully established himself in the NHL, and he is not an inherently better player than Robby Fabbri. With that said, Blais’ selection in the back end of the sixth round deserves some extra recognition on this list. He made his NHL debut in the 2017-18 season, and his AHL numbers were outstanding, with 40 points in 42 games and one hat trick. The secret with Blais was size. When he was drafted, he was undersized at just 5-f00t-9, 165 pounds. He has since sprouted, now standing 6-foot-2 and weighing 205. Despite the growth, he has not shed any of the speed or playmaking skill that warranted him consideration in the draft. He’s now looked at as a great prospect, one of the better in the Blues’ system behind some of the honorable mentions listed above. If Blais can grow from a sixth round pick to a top six star for the Blues, he could move even higher on this list as the greatest steal of the Armstrong era. Vince Dunn exploded onto the NHL scene in the 2017-18 season, seemingly out of nowhere. He overtook defensive prospects like Jake Walman and Jordan Schmaltz in last season’s training camp, and became a fixture on the big league club. In the long run, it seems likely he will quarterback a power play unit and play consistently on the top four. That the Blues drafted such a player late in the second round indicates that they know what they’re doing in the draft, particularly on defense. 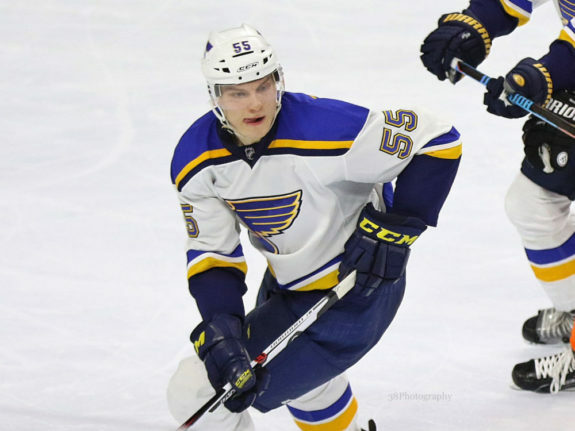 Speaking of defensemen the Blues found later in the draft, Colton Parayko has become the Blues’ foremost defenseman behind Alex Pietrangelo after being taken by the Blues deep in the third round in 2012. 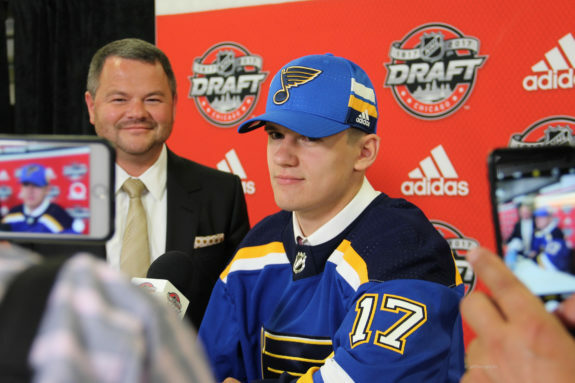 The Blues were enamored with Parayko long before he was drafted, literally hiding him as well as they could in rural Alberta so that they could take him in the middle rounds. Since the draft, Parayko has added size and he’s added skill, and he’s entrenched himself in the NHL. Though his name is often circulating in rumor mills, he isn’t going anywhere. He’s too valuable to the Blues’ defense to let him leave, and that speaks of how great a draft pick he was. It’s not often that a team can set the foundation for its forward group in one round of one draft, but that’s exactly what Doug Armstrong did with his first two picks as general manager of the Blues. With their own pick, the Blues selected Jaden Schwartz, a small but talented forward out of the USHL, then they traded David Rundblad to acquire the 16th pick, with which they chose Vladimir Tarasenko, a super talented Russian forward who fell in the draft due to fear that he might prefer the KHL. Much to the Blues’ benefit, Tarasenko chose to play in the NHL, and became a league superstar. He scored the second most goals in the league from 2015-2018, and now plays for the Blues on an incredibly reasonable contract. Schwartz, for his part, consistently ranks among the league’s most underrated players (including being voted as such by his fellow NHL players). Even so he had something of a breakout year in 2017-18, playing alongside new teammate Brayden Schenn. In Schwartz and Tarasenko, the Blues have perhaps their two most important forwards, and they selected them two picks apart in the same draft. It was a master stroke by Armstrong that established his place in the Blues’ front office, and it will be talked about by Blues fans for a very long time. 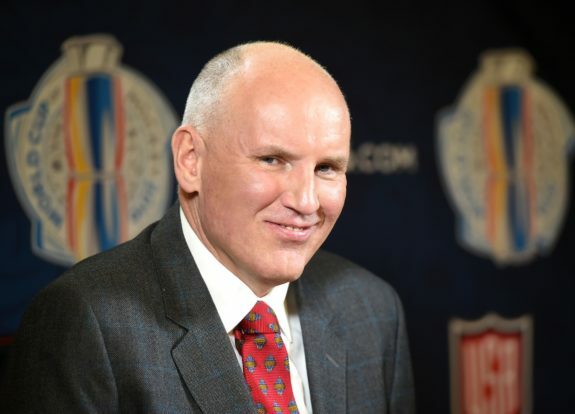 Drafting is what makes Doug Armstrong one of the league’s strongest GMs. He and his scouting department, until recently headed by Bill Armstrong (no relation) have found gem after gem through the draft, while suffering relatively few draft busts. It’s no wonder that when Martin Brodeur left the team to return to New Jersey recently, Bill Armstrong was chosen to fill his role as Assistant GM. The Blues have consistently filled needs and built their roster through the draft, something every franchise must do to succeed. Now, the Blues have a bevy of great prospects, some of them mentioned above, that could continue to build that legacy of draft success. But Blues fans will only be completely satisfied when some of those prospects parade the Stanley Cup down Market Street in St. Louis. If Doug Armstrong builds that team, he’ll be enshrined in the halls of St. Louis sports lore forever.